You have to connect parallel port ground pin out to the circuit ground. Just be careful while connecting this circuit to your computer, or it will damage your computer !!! Make sure that everything is in the place. 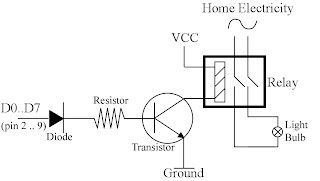 Using this circuit, if you send a “high” to the data pin out (D0 .. D7), it will trigger the transistor. It will be saturated, and let current flows through the relay and the light bulb will be connected to the electricity and light on. Use this circuit for each data pin out of your parallel port. 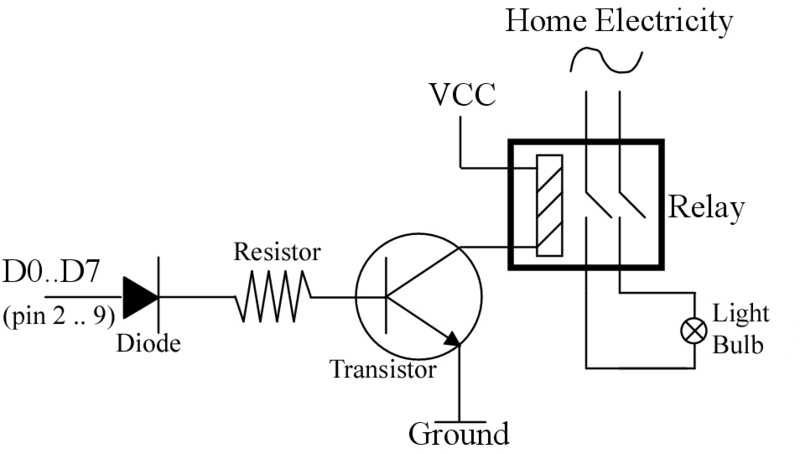 To test the program I’ve created in my previous tutorial, I use this circuit (see picture). But be careful while you connect this circuit to your parallel port. Make sure that every component is in the right place or connection, otherwise it will damage your PC !!! I use 1 KOhm resistors. 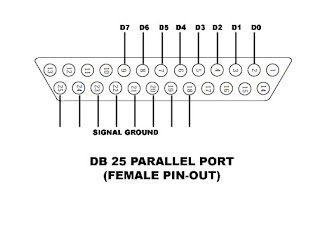 If you send an integer data = 15 to the parallel port, D0…D3 LED will be light on. And D4…D7 LED will be off. You can arrange which LED is on or off by writing some codes in Delphi. And you can also set the delay of each step you turn on or off the LED using OnTimer event of Timer component in Delphi. I’ve created an example program for you. 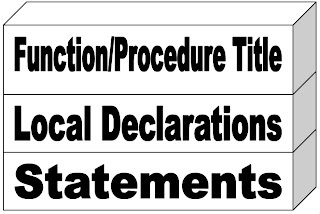 Download the example program here. 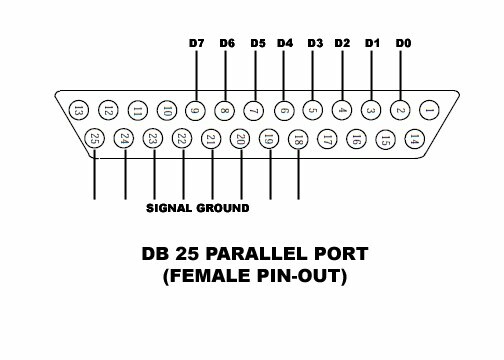 Before we create a dancing lamp using our PC’s parallel port, we have to know the parallel port female pin-out (see the picture below). How To Send Data To The Parallel Port ? To send data to the parallel port I use a DLL file (Inpout32.dll) that can be downloaded at logix4u.net, and it’s free for non-commercial manner. Place this file in C:\WINDOWS\system or in the same folder with you project you’re going to create. Pointer is a variable that points toward a memory address. So a pointer is a data address. The data is somewhere else. Below picture will show you the relationship between a pointer and a data pointed by a pointer. To free the memory that is used by a pointer, you can use dispose statement. Between the field name and the record name separated by a dot. 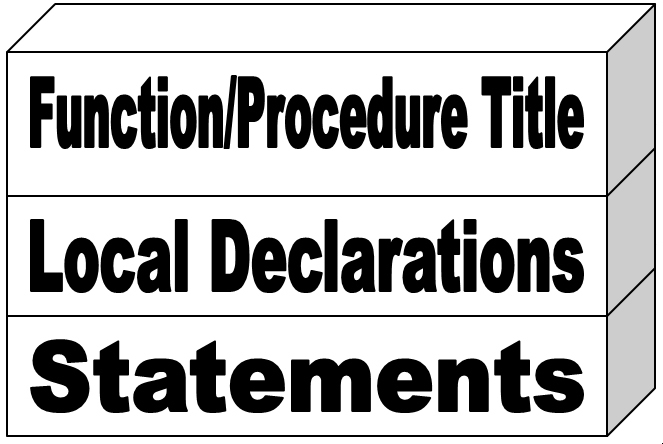 // writing teh fields' values. These links are part of a pay per click advertising program called Infolinks. Infolinks is an In Text advertising service; they take my text and create links within it. If you hover your mouse over these double underlined links, you will see a small dialog box containing an advertisement related to the text. You can choose to move the mouse away and go on with your browsing, or to click on the box and visit the relevant ad. Click here to learn more about Infolinks Double Underline Link Ads. what are in this blog ?